Unfortunately animals born with heart-shaped markings aren't very easy to come across. I say unfortunately because these creatures - although certainly not the last example unless you're into danger - would make perfect gifts for loved ones, especially on Valentine's Day. So, unless you're extremely lucky and have managed to discover such an animal, we'll have to just make do with photos. This cute little porker, aptly named Valentine, was just 10 days old when this photo was taken and is a Gloucester Old Spot piglet. However, the little beast's heart-shaped marking hasn't deceived farmer Eric Freeman who maintains that Old Spots are 'much more succulent' than most other breeds. Mmmm. This ox, born in Fujisawa, Japan, is also the owner of a unique marking but predictable name. 'Heart' was born in February of this year, apparently just in time for Valentine's Day, and as you can see sports a white heart on his forehead. Now, even without the heart in his fur you'd have to be pretty hard-faced to not fall in love with this little Chihuahua. He's called 'Heart-kun' and lives in Odate, Japan with his owner Emiko Sakurada, a breeder (of dogs) who refuses to sell this little'un. I don't blame her. In March last year, this little kitten was born in Sacramento, California and was immediately thrust into the limelight due to its markings. If you squint slightly you'll notice that it definitely, without any doubt, says I ♥ • on the kitten's fur. You'll be glad to know that the kitten's mother is called Dottie. 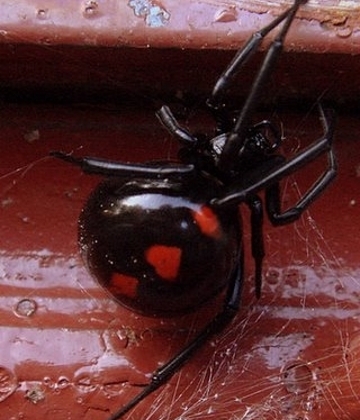 It's a Black Widow, a potentially deadly spider. No amount of heart markings could make me want to go near it. Nature is cruel sometimes.